While in Lisbon we took a quick trip over to Sintra for the day. The train is quick, cheap and easy to figure out and there are many wonderful sights to see. One of the places we visited on the day was Pena Palace. We chose to walk to the palace not quite realising how much of a hike it was, while it was beautiful scenery it sure was hard work! Make sure to get a bus or taxi up- unless you're a fan of a good hike. 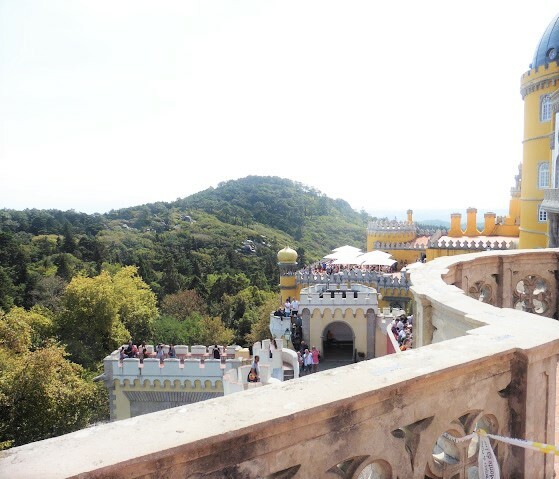 We bought a group ticket that included Pena Palace and the gardens and the Castle on the Moors. Once at the palace after our long hike we had to queue to get in and the wait was quite long so make sure you get there early if you want to avoid queues. Once inside however you moved round the rooms quite quickly having a tour round the whole of the palace and learning the history of the area. The below photo shows the dining room area which was one of the better photos that I got while inside. I didn't feel the need to take photos of a many of the rooms as the majority of them were bedrooms. We also got to go out onto the balcony which sadly was under repair at the time thus limiting photo shots. However we did get to see the stunning views from the palace and just how vast the building was itself. I loved the architecture of the building and the array of bright colours and different patterns it was painted with. Of course I did not miss the opportunity to take a selfie while I was there. All the rooms were incredibly grand and elegantly decorated, the photos above and below were my favourite with their light walls and ornate chandeliers. I really feel these were great touches to the room and that they caught your eye instantly upon entering. Once the tour was finished you exit out into the palace grounds and can the visit the gardens nearby. This is a beautiful walk again though it is quite a vast one so make sure you bring your walking shoes. There was something truly magical about Pena Palace and I have to say out of all the castles and palaces I have seen this one so far has to be my favourite. If you are visiting Lisbon you have to take a trip out to Sintra it is an incredibly beautiful town.